We have owned and cherished this property since 1999. We take great pride in it and we continually upgrade it. During your stay we are available by cell phone 24 x 7 and can arrange whatever local support you might need. *East facing! Afternoon shade! This is a must have! *Game room w/bar, fridge, sink, LED HDTV/Blue Tooth Soundbar, pool table, foosball and dart board. *Main deck is over the water. Dine on the lake! Expanded lower 2nd deck with fishing pier. *Master Bedroom has beautiful views and an electric black out shade. *Wireless high-speed internet and blue tooth sound systems. Spread out and have fun on all three levels. Sit out on the 3rd floor deck that is connected to the master. It overlooks the lake with a bit of privacy. Take a nap in the master next to the giant picture windows and dream about the view or shut the remote controlled, automatic, black out blinds for darkness. Socialize, eat or relax in the openness of the main floor. Overflow from the main level out onto the connected deck. Party in the game room on lake level game. Have a pool, foosball or darts tournament. Sleep late in the Cave. Yes there is something for everyone: Children will especially enjoy the water trampoline, kayaks & fishing from the pier. 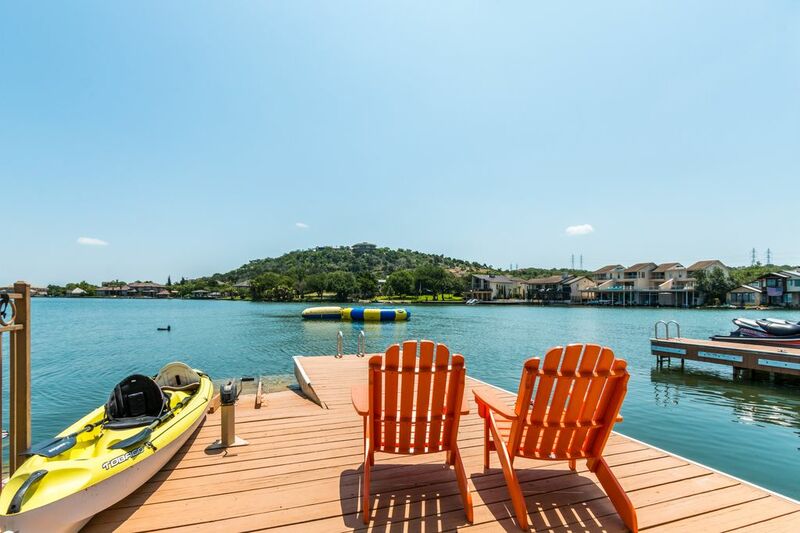 Enjoy water-skiing, jet-skiing, golfing, and swimming. Relax every evening counting stars on the deck. Horseshoe Bay is a well-known resort, just 45 minutes west of Austin, (near Marble Falls), on Lake LBJ. It's only 1.25 hours from San Antonio, Sea World, and Six Flags Fiesta Texas. And it's only 45 minutes from the famous Water Park Schlitterbahn. The resort offers boat and jet-ski rentals. It is located on a constant level lake. Nearby, are the scenic golf courses, Legends on LBJ, and Delaware Springs. It is a great place for family gatherings, over the holidays or just for the fun of it. We have four energetic boys that keep us very busy. We needed a place to call home while living overseas. We fell in love with Horseshoe Bay one summer and didn't return to Indonesia until we found our own place on the lake. We live a lot closer now and thankfully have four boys that love all the water sports. There is so much to do in our cove we never leave it: fishing, swimming, kayaking, jumping on trampoline, and all the indoor games: fusball, darts, and pool. May-September-20' diameter Water Trampoline with aqua launch attachment right in front of property.